Our facilities are equipped with the most state-of-the-art technology, offering 2 Blowtherm downdraft paint booths, a large vehicle paint booth that can accomodate up to 45 foot vehicles, and the Dupont Professional Paint-Match System. By using our Velocity Frame Measuring System, the most accurate measuring system on the market, our certified technicians can assure that your vehicle is restored to it's factory specifications. We only use the highest quality materials, featuring Dupont Paint materials and are a Dupont Alliance specialty shop. 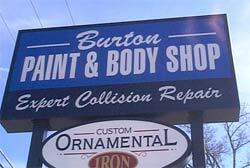 Here at Burton Paint & Body Shop, we guarantee our workmanship for as long as you own your vehicle. We take pride in what we do and would like to have the opportunity to share this passion with you, our valued customers. There is only ONE policy at Burton's! We take pride in our workmanship and guarantee the quality of our work for as long as you own your vehicle! Please contact us if there are any questions you might have. We will assist you in any way we can without hesitation. Our goal is to ensure that each and every one of our customers is 100% satisfied!